The meteorite fall discussed here has been investigated by the distinguished scientists of the Geological Survey of India, GSI. The GSI is among the oldest and most experienced institutions in the field of meteoritics. It was established in 1851 and is successfully investigating and curating meteorites since its beginning. Countless contributions and publications place the GSI among the leading institutes in the field of meteorite research. Under the diligent guidance of its internationally highly esteemed director, Shri P. M. Tejale (Status of 2008), there was no doubt that its skilled researchers would provide the best insight in this matter imaginable, once their work is completed. However, as of 2015, other than an abstract to the 72nd Annual Meteoritical Society Meeting, no scientific paper had surfaced. To fill at least part of the gap, this account provides some general insight to the interested public, into this intriguing event that occured in the beautiful heartland of South India. Friday morning, September 12, at 0830 hrs a brilliant orange light appeared at 70° in the north-northwestern sky above the sleepy Hosur Taluk in the Krishnagiri district of Tamil Nadu, India. The light flashed for an instant, turned darker and followed by a train of thick black smoke several fiery tongues radiated down towards the ground, as if an irate deity had spit fire from the skies of Krishnagiri. 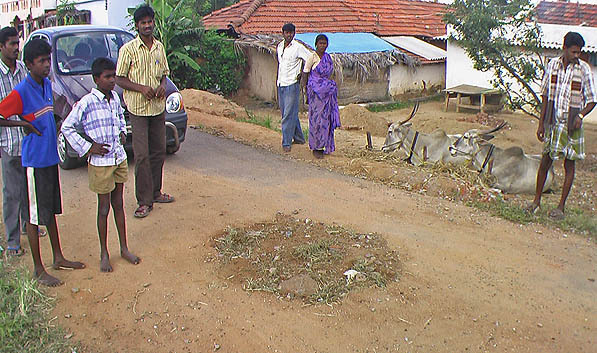 Only seconds later the villages of Attakuruki, Ullukurukki and Kamanadody became the ground zero of a tremendous blow as several meteorites, each consisting of a few kilos of extraterrestrial rock, slammed into roads and fields. The rural countryside echoed with thunderous explosions as shockwaves from atmospherical explosions rattled houses and dwellings in their foundations. Another eyewitness, G. Doraiswamy told journalists that explosions shook the ground for half a minute. A. Padbhmanan explained a rattling noise, like a train passing by, could be heard at the time of the fall. Both witnesses explained that a trail of smoke could be seen rising from the ground high up in the sky. Soon the whole village was up on the road and carefully approaching the impact pit around which the dust slowly settled. The meteorite had fallen almost vertically in the last stage of his descent. It had impacted the ground with a terminal speed of 55 meters per second or 200km per hours, subsequently penetrated a 20cm layer of tar and gravel. Its shattered fragments had buried themselves 1 meter into the ground. Fragments of rocks and meteorite were shattered around but the latter were not recognized at the spot. The excited villagers were convinced that the big bang and the gaping hole were caused “by the accidental dropping of a bomb by an IAF trainee pilot”. As the dust settled, it became clear that not one but several objects had fallen. Until the evening of September 12 three different impact sites became known and a fourth in the next morning. Two days later a fifth impact mass was reported. Until late November eight impact sites are known. 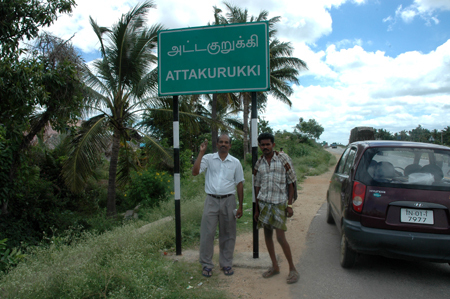 The two villages of Attakuruki and Kamanadody are both located 14km east the city of Honsur in the Krishnagiri district in the state of Tamil Nadu. The area came to importance during the reign of the ancient Western Ganga Dynasty. The Gangas of Talakad, like the Kadambas of Banavasi, rose to political eminence in the middle of the fourth century A.D. and ruled over the southern parts of Karnataka, in southern India. In present times the rural area is torn between high tech industrialization, for which the expanding titanium industry in Hosur is a good example, and the traditions of rural country life. The official language in the district is Thamizh. Krishnagiri has an average literacy rate of 72%, higher than the national average. Kamanadody has a public school and both Villages are connected to the infrastructure by the well maintained National route N°7, the longest national road in India. It connects Varanasi and Kanyakumari and runs through Krishnagiri. The average elevation of the district is 631 metres (2070 feet). The site of the meteorite fall is located a little higher on an elevation of 748 meters. Apart from an east – west chain of granite hills the land is gently undulating toward the rivers in the south and in the west. Two major rivers, Cauvery and Thenpennar, are cutting the district. The Krishnagiri dam is constructed across Thenpennar and irrigates part of the area. Most other rivers in the district, like the Chinnar, the Palar Thoppiar, Kallar, Varathiar and Pambar are minor creeks, which are dry during most part of the year. 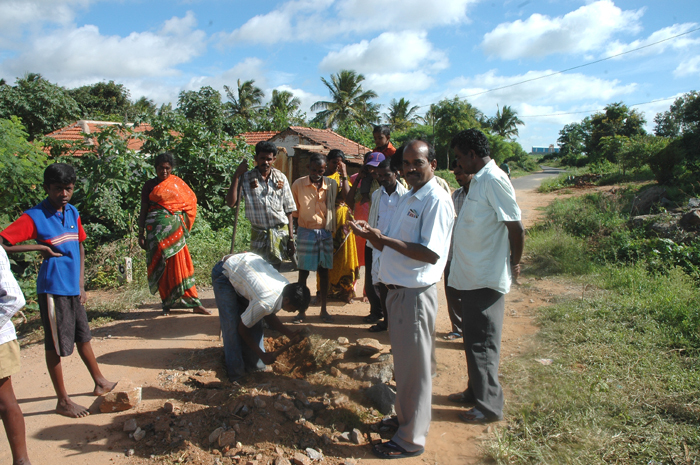 Krishnagiri District is one of the few forested areas of Tamil Nadu. Although the famous sandal wood has become scarce since the days of Tipu Sultan the evergreen woods are still a resource of rose wood, teak and the famous Charakkonnai tree. 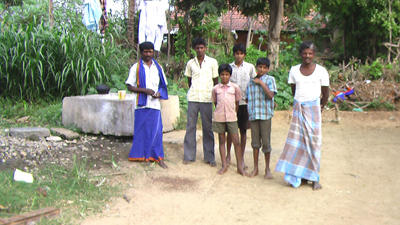 The few villages in the forests are inhabited by the Irulars which are the major tribal population in the Krishangiri district. Beside several dozen Indian tigers the forests forming part of the Eastern Ghats house a major elephant reserve. In the dry season the big animals sometimes wreak havoc among the villages in search of water. The district has hot and dry summers during the months of March to May and very cold and misty winters from November to February. The average temperature varies from 17 Degrees centigrade to 37 Degree centigrade. Average annual rainfall is 850 mm. Although the exact geological age of the the southern Dharwar Craton of Karnataka and Tamil Nadu states in south India is disputed, its origin is leading back to the Late Archean. The southern Dharwar Craton of Karnataka and Tamil Nadu states in south India exposes a depth profile of Amphibolite, Granite, Gneiss and granulite facies. There are several surface soil types in the district. In the Attakuruki area, where the meteorites fell, a red lateritic and sandy coastal alluvium soil with a generally low nitrogen and phosphate content is the most prominent. The area lives mainly on agriculture, Nearly 74 % of the workforce is dependant on agriculture, 43 % are cultivators and the rest 31 % agricultural labourers. Rice, ragi, pulses, groundnut, sugarcane, cotton, coconut and samai are the major crops cultivated. But the major fruit is the Mango. Krishnagiri in fact is considered the birth place for Mangos. With 300.17 km² of cultivation the district produces 300,000 tones annually. 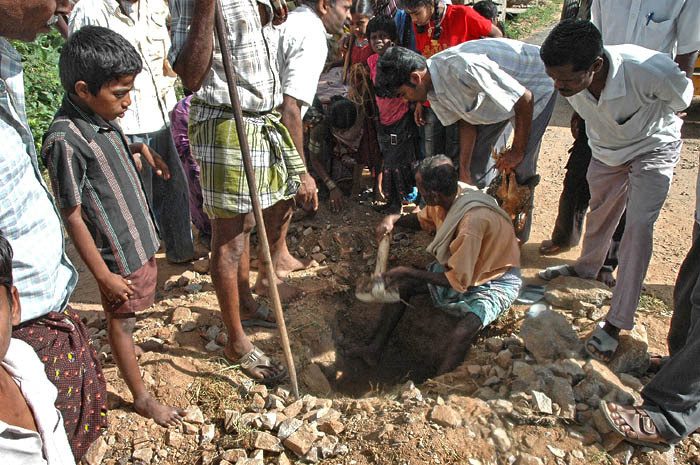 Beside agriculture, several surface mining pits are located in the Attakuruki and Kamanadody area. Particularly the famous silver grey and silver black granite is quarried here. 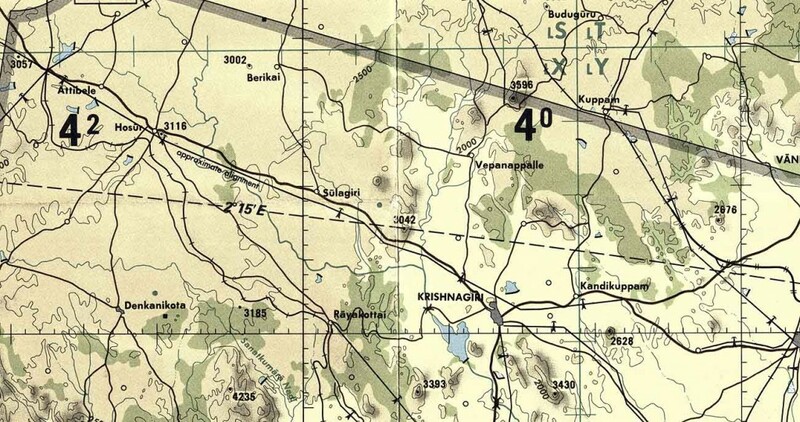 “Krishnagiri” is in fact a Sanskrit word that means, “Black Mountain”.